RAWRweekly: New Year Happenings | RAWRtacular! Hello and welcome to another traditionally late installment of RAWRweekly. I’ve been having a busy January folks, some of which is due to bad stuff while the rest is down to me knuckling down to some hard work here on RAWRtacular, and elsewhere. First off, January had a milestone for me, in the form of a pod-cast review. I’ve never had one of these done before (it’s been either a written review or nothing at all so far), and it was an interesting sensation to listen to 2 people talk about something I had done. Here’s the link the original podcast. The review was really for Black Snow Comics, and while covering the site’s flagship comics (Two Drink Minimum and I’m Famous), they also had a look at our collaboration comic: I’m Famous in Japan. It was a bit of a mixed bag. They did offer my artwork some praise, and they did even call me ‘ruler-savvy’ (which sounded like a good thing), but what took me back was how they managed to catch some of my bad-habits and shortcuts. They even noticed something on Page 6 which I didn’t think anyone would catch. How friendly are those girls? Really? When I was drawing the two female reporters hugging in the final panel, I wasn’t sure if I would go for a cutesy embrace of shared relief, or if instead I would do something a little more ‘adult’. They seemed to notice that, and that impressed me. They even caught onto my use of wire-frame buildings, which has solidified my decision to not use them anymore. At very least not until my line-work becomes ‘tighter’. Despite several fair-cops on my artwork and failings, they claimed to recommend I’m Famous in Japan over the other comics there. But they did this in a way that was a little jarring. They essentially said that all of the comics at Black Snow were crap, and that I’m Famous in Japan was merely less-crap. They would not recommend any of the comics there. I didn’t really like that. They were also very harsh on the writing of Alex, and artwork of Michael. They didn’t seem to get the humor of Black Snow, and were very nit-picky on many aspects of Michael’s art. They also didn’t seem to check any of his later work to see if there was improvement, which isn’t all that fair. Michael’s art is always maturing and becoming more and more complex. They miss out a lot by only checking out the beginning. Also Alex’s writing is gold. It takes a certain kind of humor to enjoy some of it, and I know that there are a lot of people out there who enjoy it. It’s encouraging to see the that guy’s response to this critique has been a series of even more atmospheric pages in Black Snow: Two Drink Minimum. I will also re-double my efforts in I’m Famous in Japan, in the hope that I can improve my art there. January saw my first meeting with KANDU, a volunteer group here in Norway who focus on encouraging digital creativity. I hope to be joining them at this year’s ‘The Gathering’ at Hamar, as a fellow volunteer. The Gathering: That's a LOT of gamers!! It’s been a long time since I volunteered for anything, and it’s an interesting, yet familiar feeling . I’m hoping to get more in touch with my peers, potential readers and just the whole realm of digital nerd-dom that the past decade has sort of stolen from me. Expect to hear more about these guys in future RAWRlogs. There’s been a bit of a change in the scope of RAWRtacular’s plans for this year. I thought that 2012 would become a stable year, and it appears that will not be the case anymore. It’s a long story, which I won’t go into here on RAWRlog, but pressure on time will result in me only managing to update Bata Neart and Back Office as per usual (and Famous Japan whenever I can). Please bear with me while this rather jam-packed time. This doesn’t mean that all of the crazy stuff I promised at New Years won’t happen, it just won’t happen straightaway. I hope that’s fine. This entry was posted in I'm Famous in Japan. Bookmark the permalink. Don’t let the Deconstructing Comics review bug you too much, I really have lost some faith in the whole online webcomic review process. I’ll take it more seriously when I get someone who really to take the reviewing task a bit more seriously. I was struck by how unprepared and nonchalant they were in the podcast, with the exception of a few prepared topics. They did seem a lot more prepared to discuss I’m Famous in Japan!, which makes me think it is because they critiqued it more closely because they enjoyed it more. So despite their claim of not recommending any, I think they actually had to enjoy your work to look at it so closely. I think they were overly critical overall and you are doing an amazing job! It has been a blast, and that last page with the “burn it down” had me laughing like a lunatic (or a Lone Wolf). So use the review as a little creative fuel then put it out of your mind and keep up the fantastic job on all 3 comics! Thank you yet again for you kind words Michael. The Deconstructing Comics review didn’t really bug me all that much, but like you I do feel a little disenfranchised with the whole reviewing thing. They did however, give me some genuine creative criticism, which I’m grateful for and I am taking on board in future work. 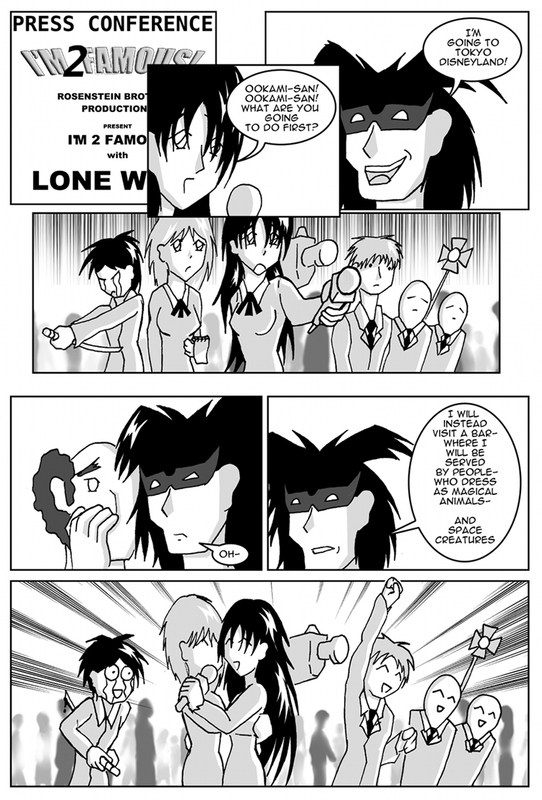 Glad you liked Lone Wolf’s ‘Lunatic moment’ in the last Famous Japan page, I was hoping you’d react that way 🙂 Again, our collaboration has been the most rewarding aspect of this whole Web-Comic thing I have found myself in for the past two years. I’m really looking forward to forging some more Famous Japan pages with you guys soon. Also, thanks for following Back Office and Bata Neart! I know you’re not a manga fan anymore, and I appreciate the fact that you take the time to read my stuff in spite of that. I hope to be supplying even better work on all 3 comics in the near future.